The anti-corruption campaign in China led by Communist Party leader Xi Jinping shows no signs of slowing down, with the recent removal of a provincial official who once penned a self-criticism letter while the Party boss himself looked on. Zhou Benshun, the Party secretary of Hebei, a heavily populated and industrialized province that surrounds the capital Beijing, was put under investigation on Friday, July 24, according to a terse announcement by the regime’s disciplinary watchdog. Even his closest colleagues appeared blindsided by the news, which was published after close of business on Friday. “Hebei officialdom was stunned,” wrote Caixin, a business publication with close ties to the current leadership. On the very day of Zhou’s arrest, he had presided over a meeting about development of the Jing-Jin-Ji megacity that is to surround Beijing. “Who would have thought that that very evening the news would come out that he’d been arrested,” Caixin quotes an official saying. The Central Commission for Discipline Inspection, the Party’s watchdog, rarely spells out the actual reasons for its actions. Its note on Zhou merely said that he was being investigated for violations of “discipline” and the law, shedding little real light on what Zhou was actually guilty of, and why it was only now—as the Party’s anti-corruption campaign appears to be at a lull—that the news was announced. The reference, of course, is to Zhou Yongkang, the Communist Party’s former security boss who was himself sentenced to life in prison just last month. Who would have thought that that very evening the news would come out that he’d been arrested. Zhou Yongkang was one of the most powerful men in China during the prime of his powers, from 2007 to 2012, and his fall from grace was largely unexpected on the part of most external observers. Zhou Benshun was part of the political clique, along with Zhou Yongkang, former Politburo member Bo Xilai, and others, who conspired for power in the Communist Party before the current head, Xi Jinping, came to reign. 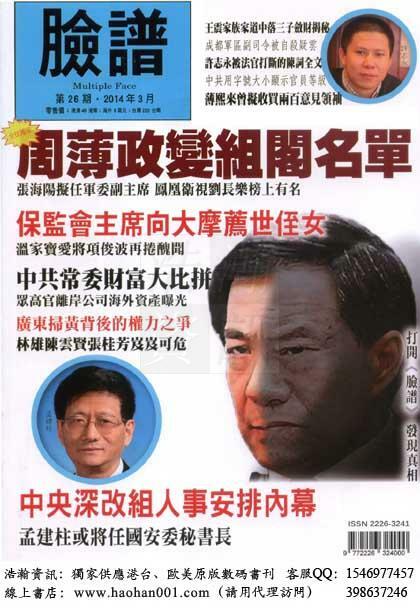 The Epoch Times was reporting on the existence of such a cabal, and its activities, in early 2012—but it was not until the sequential destruction of Bo Xilai, Zhou Yongkang, and many others, that the idea began to seep into the broader understanding of Chinese affairs. A number of official, and many semi-official, Chinese propaganda outlets have accused these officials of engaging in anti-Party activities—in other words, a coup—and some senior officials have directly accused them of having conspired to seize power. It is widely believed that Xi Jinping, who now rules the Party, was able to gain power for himself in November 2012 after the coup unraveled with the attempted February 2012 defection of Bo Xilai’s chief of police, in the city of Chongqing, to the American Consulate in Chengdu. Zhou Benshun was identified as part of this political network by Hong Kong and mainland media. He has extensive experience in the Political and Legal Affairs Commission, the small but powerful Party agency that runs the Communist Party’s security, legal, and penal systems, formerly headed by Zhou Yongkang. The two men share the same family name in Chinese but are not related. Zhou Benshun was a deputy secretary and then a secretary general in the PLAC from 2003 to 2012, his promotions following closely those of his mentor, Zhou Yongkang. He was a “mishu,” something akin to a chief of staff, for Zhou during his time in that agency. The mishu role in the Chinese Communist Party is deeply political, given that such individuals control access to their masters, accompany them during travel, and help to communicate and mediate between them and other powerful officials. Alongside his association and secretaryship with Zhou Yongkang, one of the most reviled figures in Chinese politics for decades, Zhou Benshun has accumulated his own unsavory record of abuse, violence, and repression. He’s always afraid of making mistakes. He dared not touch anything. He had done nothing in politics or economy. He’s done nothing to impress anyone. During his post as secretary of the Hunan politics and legal affairs commission, for example, he took on a proactive role in implementing the persecution of Falun Gong, a traditional spiritual discipline. That campaign involves arbitrary arrests, incarceration, and torture. He was also widely believed to have been involved in the suspicious death of the Hunan pro-democracy activist Li Wangyang, which brought large street protests in Hong Kong. And his fingerprints are on the recent anti-NGO laws, which call for almost entirely banishing from China all foreign nongovernmental organizations. Zhou did continue his campaign against Falun Gong, though, after stepping into the new role. In August 2013, the Hebei 610 Office—an extralegal Party agency that was set up specifically to target Falun Gong practitioners for persecution—sprung into action, organizing the kind of anti-Falun Gong propaganda on television that had not been seen for years, and orchestrating arrests of several dozen Falun Gong adherents and family members. The other noteworthy act of Zhou’s time in Hebei was his public self-criticism, in front of Party leader Xi Jinping himself. This took place in September 2013. Photos were shown in the Chinese media of Xi Jinping seated at the head of the table, looking on as Zhou Benshun pens a letter faulting his previous conduct.